Also known as the white-tailed gnu, the black wildebeest is a really cool animal that I would like to write about today. These large antelopes can grow to up to 220 cm long and weigh up to 180 kg. Despite their size, the black wildebeest is a very fast runner so that they can escape from their main predators, lions, leopards, hyenas and African wild dogs. They have been measured at up to 80 kph. They also have to be careful of crocodiles when they get a drink or cross large rivers. They have much larger and heavier horns than the common wildebeest, measuring up to 78 cm long. The calves can stand up and run almost immediately after birth and have short straight horns that curve as they grow older. At one stage, the black wildebeest was extinct in the wild, with only a few hundred remaining in private farms in South Africa. Now they have been returned to their former range in Swaziland and Lesotho. They have also been introduced to Namibia. They are now no longer in danger of extinction. 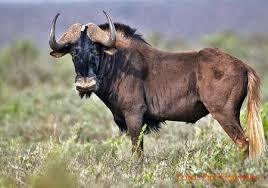 Are there any other interesting facts that you would like to share about the black wildebeest? Thank you for this post on the white-tailed gnu! These beautiful bovid may not be an endangered species, but humans should choose not to take any of these magnificent creatures for granted. Great blog site here; Bookmarked!